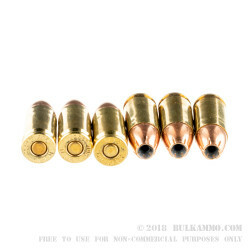 This bulk 500 round count of Winchester 115 grain jacketed hollow point 9mm ammunition delivers muzzle velocity of 1225 feet per second. 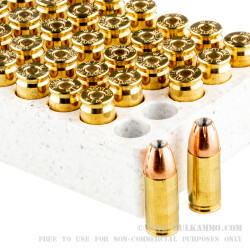 It is a boxer primed brass casing which will allow it to be reloaded if you wish. 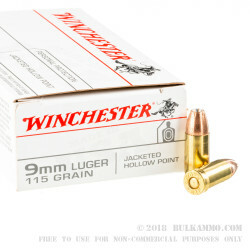 This may not be the highest quality component hollow point that Winchester produces, but because of that it comes in a very reasonable price per round which makes it ideal if you need a larger amount of hollow points. It is still be just as reliable, accurate, and consistent as you have come to expect from Winchester. 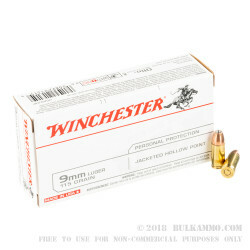 If you are looking for Winchester higher end hollow point ammo for self defense, don't forget to check out their Defender line of ammunition as well. Winchester ammunition is made here in the USA, and has long been a go to for shooters for their ammunition needs of all types. Founded in 1866 they now produce anything from ammo for the range, to hunting, to self defense. This is accomplished from their new plant opened in 2005 located in Oxford, MS filled with all state of the art ammunition production machinery. As of 2016 Winchester celebrated their 150th year of a proud American traditional of supplying the military and public with high quality ammunition. All as ordered, well received. Will do business again!